The launch of Sputnik, the first man-made satellite, 60 years ago kicked off the space race between the Soviet Union and America. The satellite was a success not just in terms of scientific advancement but in terms of providing a propaganda opportunity for the socialist state. Early reports detailed a wealth of technical information about the launch of the “Earth satellite”, such was the general interest in it. One news correspondent described seeing the satellite appear “like a flashing spark over the horizon” and the Communist Party’s main newspaper, Pravda, wrote that “all the world heard the announcement of the launching of the artificial moon”. But reports by the state news agency Tass also mentioned its orbital velocity of about 8km a second, the fact that it was travelling at up to 900km above the surface of the earth, and that Sputnik was making one complete revolution in an hour and 35 minutes. 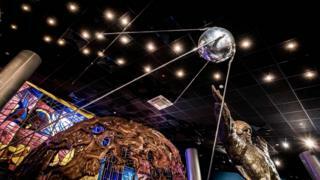 Russian media also detailed the frequencies and wavelengths on which Sputnik was emitting regular beeps, saying its transmitters were powerful enough for amateur radio operators to be able to receive them. Later, radio broadcasts to America touted the fact that the Soviet magazine Radio was offering “special prizes” for radio hams who submitted reports of the signals. Special broadcasts listed the places and times the satellite was expected to pass over. The day after its launch, Tass and Russian radio reported world reaction to it, noting how major media outlets like AFP, the Daily Mail and the BBC had reported it and how “some US radio stations interrupted their programmes in order to broadcast the satellite’s signals”. On Soviet radio, various scientists, such as jet propulsion expert Professor Kirill Stanyukovich, called it “a great victory not only for Soviet science but also for the Soviet order”. Several digs at America made their way into reports. Today, the name Sputnik is also associated with an international news agency, which has a presence on the web and radio, and is one of the main media outlets through which Russia influences global opinion. Sputnik tends to seek audiences on the political margins – whether it’s supporters of the Front National in France, or the Democrat Bernie Sanders in the US. Its political stances include the idea that NATO is a menace to world peace, criticism of what it sees as US hegemony, and the general decadence of Western democracies and their institutions, especially in the face of the challenges posed by Islamist terrorism and migration into Europe. Sputnik is still potent force for Russian influence, just in a different sort of space now.